Cam: “What uncertain economy?”. 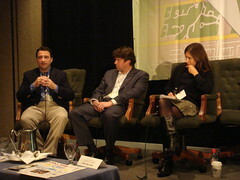 Panel will offer two perspectives: Agency (LeeAnn and Roger) and a client side marketer or CMO perspective (Joe). LeeAnn from Efficient Frontier, manages 300-400 million in paid search management. EFF has seen an increase in spend of 35% over the past year. Roger from SearchIgnite explains their technology platform and says they haven’t had that much fluctuation. Joe from EDMC gives a client perspective. EDMC is a parent company, direct response. 70& of students from marketing, lead gen. Sees search spend rates to continue. In the past took a leap of faith and spent more without the data tracking and now that they have that, they’ll continue. Cam: Is search recession proof? How can you leverage search differently than other media? Joe says yes. Mentions the current political situation bringing more into search. Roger, maybe not recession proof but certainly more resilient than other channels. Cam: Mentions Forrester report that applies the same metrics to all online media. There’s so many marketers (40% enterprise 60% midsize) getting into search. How can that new flow of dollars in to search be affected by an economic slowdown? Will there be a cyclical effect to search? LeeAnn the trend towards search will continue. Cites Shar’s report (Forrrester) indicating percent of search spend at 8% but increasing to 18%. Search is getting more scruitiny, driving more efficiency. Search isn’t just acquisition, it’s also increasingly used for branding. Doesn’t see search declining in the near or far future. Joe: Those that are doing well now with search will continue to spend. From an effectiveness perspective, there’s nothing like the web: SEO, PPC. Cam: What are some of the tactics managing search campaigns. What kinds of techniques do you see marketers using in channels that will be affected by an economic slowdown? Roger: Take a look at potential bellweather terms and if ROI tends to slip, act accordingly. Also look at rank volatility, which might be an effect of competitors making wholesale changes. LeeAnn: Some of the things clients do to react to uncertain times is to adjust metrics. Example, segmenting leads into categories.Â Other advertisers are changing messaging in their ad copy to reflect more security. Being reactive to market announcements in ad copy (dynamically managing). Joe mentions that agencies can probably increase their margins in an uncertain time by providing more value. Examples like making strategic and tactical recommendations to give clients an advantage, such as LeeAnn’s suggestion about reacting to market announcements with changes in ad copy. He also mentions that the agencies that can help clients navigate the complexity of implementing SEO recommendations within complex organizations will be in demand. Cam: It seems search is recession proof, but how many marketers have contingency plans in case the economy takes a downturn? Guy from Lenovo says their budgets are already so slim, they’re already budgeting as if they are in a recession. 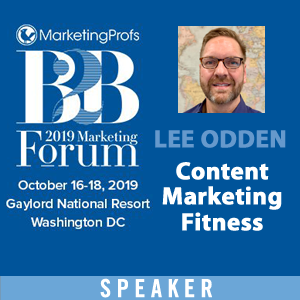 Lee – thanks for covering the sessions! I want to clarify a few points – Efficient Frontier is managing more than $400 million per year in search spend. We have seen a 35% increase in spend for financial services clients that we have had for more than a year. Overall spend is growing much faster as we add new clients. Forrester’s Interactive Marketing Forecast, by Shar Van Boskirk, states that 8% of 2007 total ad spend will be online. By 2012 Forrester estimates that online will account for 18% of total ad spend. They predict that search will remain a consistent portion of online ad spend, at about 42%, with an CAGR of 26% from 2007 – 2012.